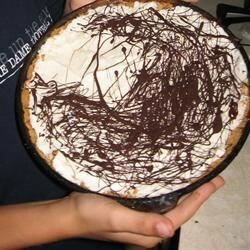 "This fabulous ice-cream pie can be made in any flavor you want!. It's so quick! Racers love it 'cause it's FAST! Use your favorite ice cream, plain old vanilla is fine." Bake crust in preheated oven for 8 to 10 minutes, until lightly browned. Allow to cool. Spread ice cream into crust and serve immediately. See how to make an awesome frozen pie with plenty of fudge sauce! Whomever invented this one was a genius! My kids can't get enough of this Very Good Pie!!!!!!!! Simple and good. Needed the full container (1.5 quarts) of ice cream. Used the recipe for 'Graham Cracker Crust I'. Fun to decorate with melted chocolate chips. My kids love it!! Very easy and quick.